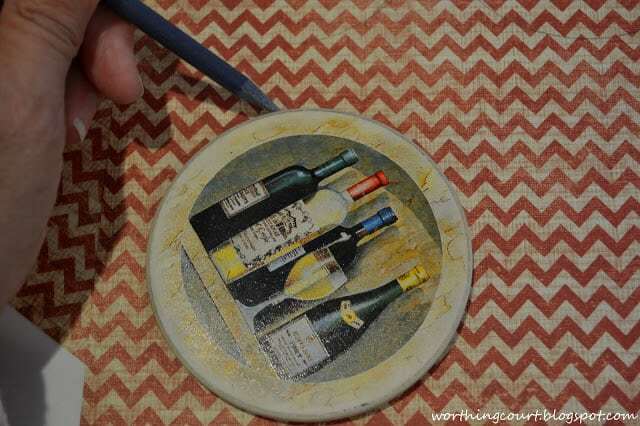 This is such an easy peasy project that I can’t believe I haven’t tackled it before now. I’ve had a set of absorbent coasters with a design that wasn’t my taste for years. When inspiration struck, I gathered my supplies and went to work. 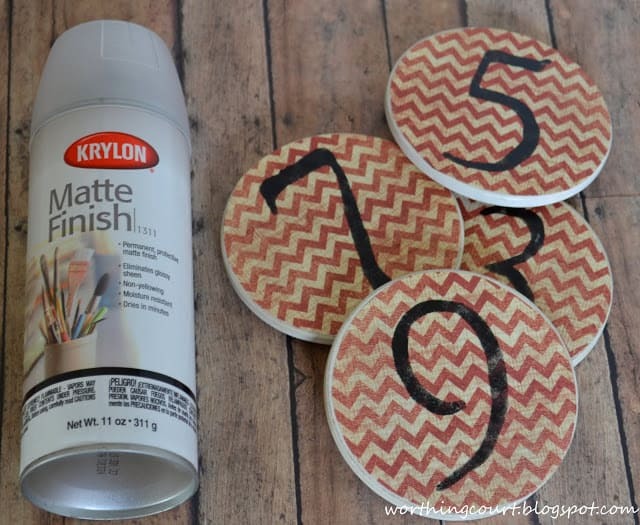 The only item that I purchased for this project are two sheets of chevron scrapbook paper. I purchased them at Hobby Lobby when their scrapbook paper was on sale for 40% off. 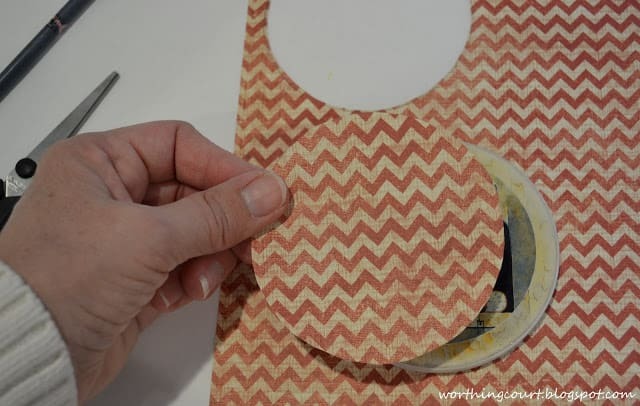 First step – trace the shape of the coasters on the scrapbook paper and cut them out. 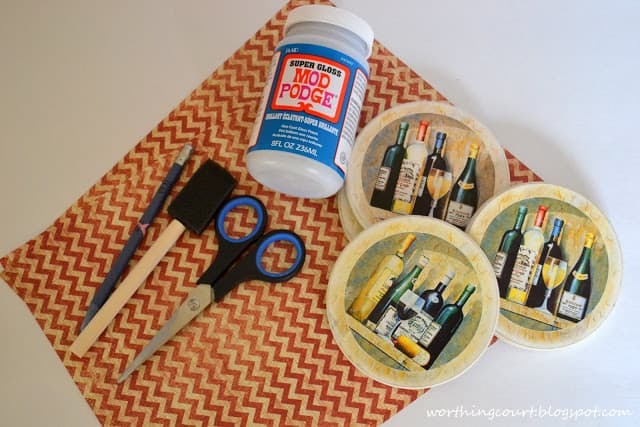 Apply a smooth coat of ModPodge to the surface of a coaster. Only work on one coaster at a time to keep the ModPodge from drying out. Center a cutout on top of the coaster and lay it on the coaster while the ModPodge is wet. Make sure to gently smooth out any bubbles. 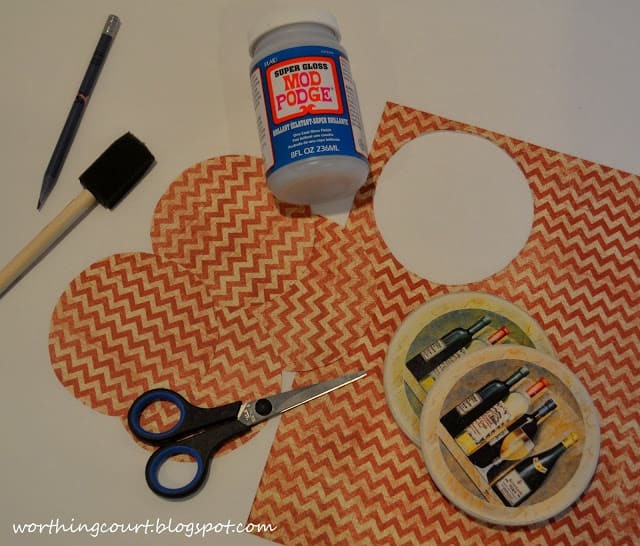 When completely dry, stencil your desired design onto the scrapbook paper using acrylic paint. Make sure to wipe/blot excess paint off off your paint applicator before stenciling or the paint will seep up under the edges. Allow the paint to completely dry and apply several protective coats of clear sealer. Dry thoroughly between each coat of sealer. These are going to look great in my basement! Click here to see other projects that have been completed for my basement re-do. What a great idea! Would have never thought of that. Thanks for sharing! 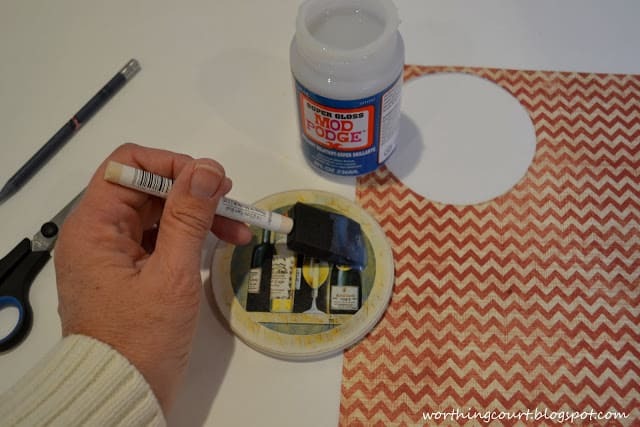 Great project Suzy…love that you can customize coasters…love the new design! Have a great day! Great idea, Suzy. I had similar coasters once upon a time. Should have kept them! Great project, they turned out really cute. Have a great day Suzy! These look great. You are so creative and I know they will look great in the basement. I notice you have on a sweater. How is the weather today. It is 80 degrees today but I am ironing. Fantastic, Judy! What a great idea and awesome tutorial! 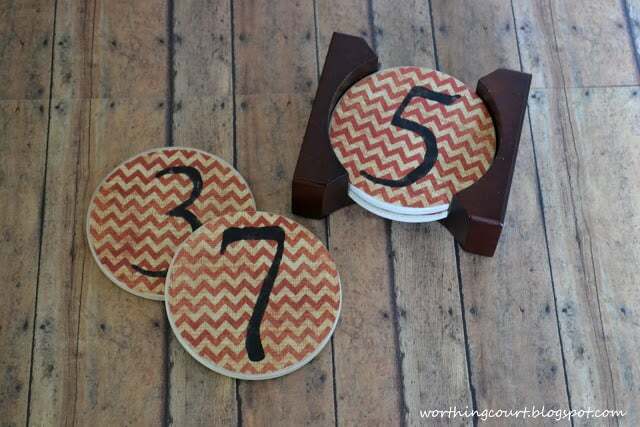 I love the chevron pattern you chose, too! I love everything numbered and of course anything I can set my cocktail on is a good thing! Pinning these cuties! They look amazing! Great idea! Great idea and they look awesome!! I would love for you to link up at my craft party! Just follow the link….http://sew-licious.blogspot.com/2013/04/saturday-show-licious-craft-showcase-27.html. 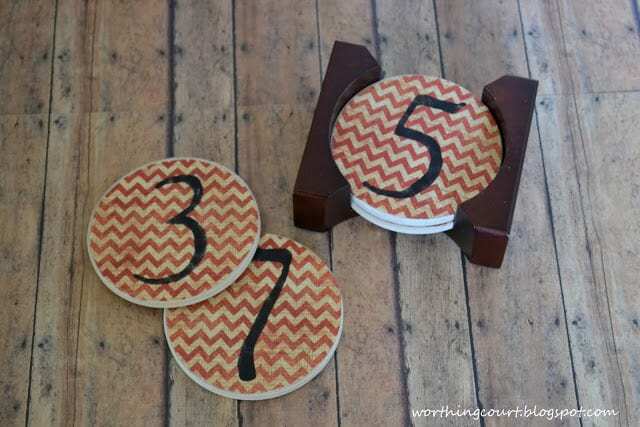 Oh my gosh, I love these coasters! They look awesome all the way down to the stencil of the numbers. Pinned this to the DIY board! Great work! 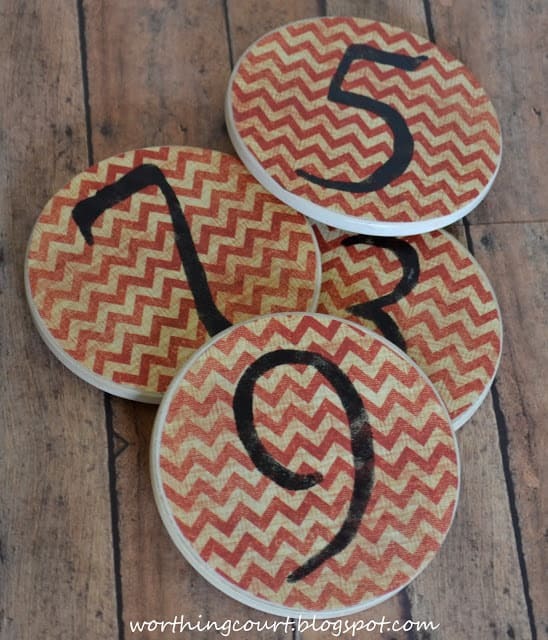 Your coasters look so great and unique. I love the patterns, colors, and numbers.